On Friday, Spanish Supreme Court Judge Pablo Llarena activated a European arrest warrant for 25 Catalan politicians, including Puigdemont, regarding the illegitimate Catalan independence referendum of October 1. 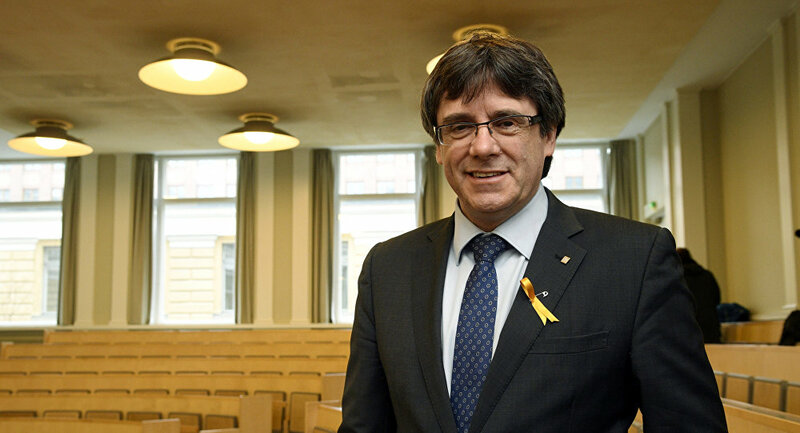 Shortly thereafter, Puigdemont was detained in Germany after he crossed the border with Denmark on his way from Finland to Belgium. MADRID (Sputnik) — The Catalan parliament has passed a resolution that recognizes the right of former Catalan leader Carles Puigdemont and other arrested Catalan politicians to pursue running for office, local media reported on Wednesday. The resolution was backed by three pro-independence parties — Together for Catalonia (JxCat), Catalan Republican Left (ERC) and Popular Unity Candidacy (CUP) — who together have the majority of votes. The resolution calls on the Catalan parliament to "adopt all necessary measures to guarantee" that Puigdemont can "exercise his political rights," including the right to lead the autonomous community. This resolution also concerns political activist Jordi Sanchez and former government speaker Jordi Turull, who are currently in pre-trial detention in Madrid along with other seven Catalan politicians. Puigdemont, Sanchez and Turull have been implicated in the investigation into the illegitimate independence referendum and unilateral declaration of independence in 2017. Earlier, the Spanish Supreme Court ordered that all candidates seeking Catalonia’s highest office must be physically present at the investiture meeting. The Catalan parliament also passed a resolution urging for the release of the detained politicians. Together for Catalonia nominated three candidates to become head of the Catalan government — Puigdemont, Sanchez and Turull. Puigdemont and Sanchez later withdrew their candidacies. Last week, Catalonia’s parliament failed to appoint a new regional president after Turull fell short of the necessary votes. Shortly thereafter, a Spanish Supreme Court judge ruled to arrest Turull in regard to the illegitimate independence referendum. The second round of the vote on Turull’s candidacy was canceled due to his detention. On October 1, Catalonia held an independence referendum, which the central authorities did not recognize. The results showed that the majority of Catalans supported secession, and the regional parliament unilaterally announced independence later in October. In response, Madrid imposed direct rule over the autonomous region, dissolved the Catalan parliament and called a snap election. Several pro-independence leaders were jailed, while others fled to Belgium.